Seven weeks after surgery on my knee, I have finally been able to step into my workshop this weekend and do more than fondle the tool handles and sniff leftover sawdust up a shortened straw directly into my nostrils. That type of behavior gets me kicked out of most establishments but in my shop only the self righteous spoke-shaves look down their blades at my behavior. It certainly felt wonderful to strike a knife line against the blade of my tri-square and then divide the fibers of the a cherry board with the biting teeth of a saw. It felt good and natural to be at the bench again. 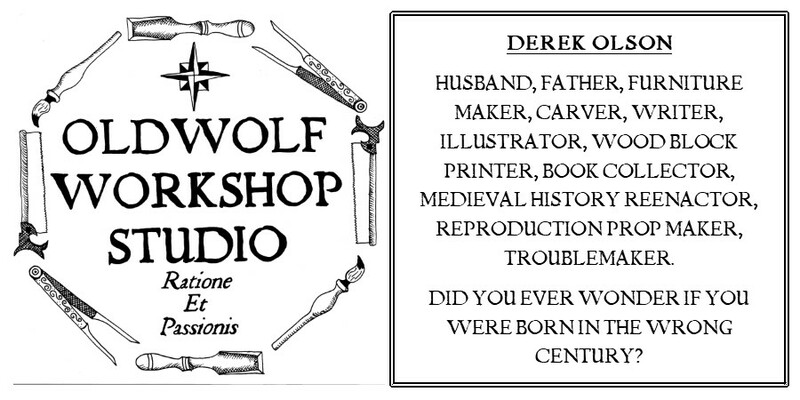 The question I had pondered for weeks was what to start working on when I returned from my workshop sabbatical. For a time before the break I spent a lot of time on 17th century carving and boxes. An exploration I am not nearly done with by any means, but I wanted to stretch my wings a bit. I've become enamored of certain furniture forms over the years, nearly obsessed with some. Boxes and chests for certain, but an extension of that is a fascination with spice chests or spice cabinets. A scale drawing of a spice chest design I started working on this past December. I'm not sure if its the diminutive size, the apothecary of drawers held safe behind the door or the possibilities of hidden drawers, compartments and secrets that give me such a mixed bag of rapture, envy, and desire, but spice chests have always done it for me. Until recent years I thought such a project was above my pay grade, and it probably was. I spent many years thirsting after a nuclear powered New Yankee workshop where "biscuits" would always be the magic word of the day. I shoved boards through my table saw and over my router table like a madman and I never really accomplished anything I can say I'm proud of today. I can appreciate some of the things I made for what they were, and where I was at the time, but they're nothing special. It wasn't until I was forced to slow down and found myself with a very small shop space that would only let me work with hand tools that I started to understand some things about woodworking that were epiphanies to me. I came to a different understanding of woodworking and what I was trying to accomplish. Erroneously power tools lead me to a production mentality, this in turn lead my poor weak mind down the path of believing in quantity over quality. There was less THOUGHT involved in my output and more DO. Some might not see this as a vice, and I really don't either, but it was for sure a crutch and an excuse. "Ah I can only get away with what the machines will let me do. 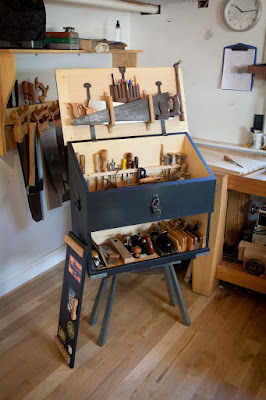 If I could afford all the router bits I NEED, then I could really turn out some good stuff!" Somewhere in my mind, even then, I knew I wanted to make a spice chest, but I'm glad I didn't go for it. I would have mangled the concept something fierce. (Why do they always print these cut lists wrong?) I possibly would have ruined it for myself and I would now have a spice chest shaped object gathering dust somewhere in my home and waiting for the day it could return the Island of Misfit Toys. Late December this last year I started thinking it might be time to tackle the my spice chest demons. I was inspired reading about Megan Fitzpatrick's hurried end of the year build of her own spice chest. (Quite the story you should give it a read.) I pulled out all the plans I could find in old magazines and in project books I'd collected and opened them all up to try and boil down the different ideas into one tasty soup. I came up with a design that was different than all the parts. Everything was looking 18th century and traditional until I started playing with what I wanted the door of the cabinet to look like. Most pieces I had pictures for had either inlays, marquetry, or highly figured walnut burl veneer. I don't want people to throw stones but to me veneering has always had a hint of used car salesman to it. Yes, on a intellectual level I get it and I totally buy in, but on a soulful level, I guess I'm just not there yet. Maybe someday. Inlay and marquetry do feel less dirty to me, but I am not ready to jump into that pool yet either. The door I sketched that I liked best looked very Arts and Crafts style, and this turned the whole design on it's head for me. I sketched it up and then drew it out to scale on graph paper and there were lots of things I liked about it, and several things I didn't care for. I struggled with the base and feet of the piece, Truth be told I'm still struggling with them today. There were several other aesthetics that just didn't feel right. I put the drawings to the side and focused on other things. As the time ticked down to my return, I decided I needed a challenge to get me up and going again. I started to sketch the lines of the spice cabinet again, refining some ideas, adding some and subtracting some. In the end I came away with two things. 1: I have a nearly clear picture of the project in my mind and mostly represented on paper. The details of the design will flush out as I move forward and make the decisions as the piece demands them. The only thing that bothers my mind is those damned feet. and 2: Now that I have a sense of the spirit of the piece I have managed to put down all my anxiety about the piece. I am confident in my technical skills to pull it off and I know the devil will come in the details but as long as I keep moving forward and make the best decisions I can then in the end, even if I'm not happy with the whole piece, I will be happy with parts of it and maybe that's just enough for a comeback. Late Friday night I stole into the shop and laid a nice wide cherry board I had been saving down on my sawhorses. I measured and struck a line and cut off three lengths of board to make the outer carcass of the cabinet. Then I went to bed smiling. It was cooking up to be a good weekend. Check out Megan Fitzpatrick's record of her harried rush to finish an impressive piece as the Christmas Rush descended on her over at the Popular Woodworking Blogs HERE. I have been reading your blog for a while. Building a spice box was a challenge for me, so I stick to the plans I found in PopWWM. I had lots of fun during those three weeks!! You got a nice looking spice chest and some other good work going on over there my friend. Excellent work.